You are here: Gourmet Master Gourmet Master Corn Noodle - 48oz. 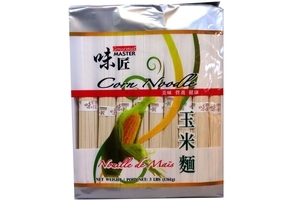 Gourmet Master Corn Noodle in 48oz (1361g) pack. They are generally boiled, although they may also be deep-fried in oil until crispy. Boiled noodles may then be stir fried, served with sauce or other accompaniments, or served in soup, often with meat and other ingredients. Product of China. Wheat Flour, Corn Flour, Salt, Sodium Carbonate. Customer reviews of Corn Noodle - 48oz.